Calibration solution 6.86 7.01 Group & group-Accessories-PH meter, electronic salinometer, industrial pH meter, pen pH meter, pH electrode, pH controller, pen type conductance - Shenzhen kedida Electronics Co., Ltd. The instrument is shipped with three bags of powdered standard buffer, each packet of powdered standard buffer can be formulated 250mL buffer. Do not use a metal container buffer preparation. With a capacity greater than 1. Prepare 250mL clear plastic (glass) container, remove the pH = 6.86 (green) buffer plastic pouch, tear it to the inside of the white powder was poured into the container. 2. Add 250mL of distilled water in plastic (glass) container, if distilled water is not available commercially bottled 250mL pure water instead. 3. Use a clean glass rod or other tool slowly stir until all the powder dissolved. 4. preparation 4.01 and 9.18 standard buffer as above. Three buffers preparation is complete, should be promptly posted a good label to prevent future unclear. 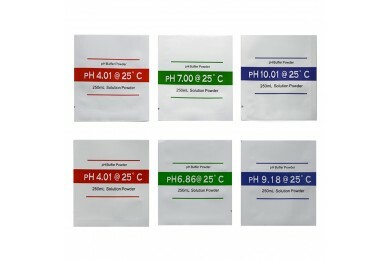 250mL buffer can be divided into multiple use, when the instrument is calibrated with three plastic (glass) small container, pour 4.01,6.86 and 9.18 respectively buffer and marked. The amount of buffer as long as they can overwhelm the glass electrode. Used buffer should be drained Do not reuse. The remaining portion is stored at 20-25 ℃ cool dry place. Shenzhen Ke Dida company specializes in providing electronic pH meter, conductivity meter, floor heating thermostat, pH electrode, pH controllers, industrial pH meter, pH / ORP controllers, heating thermostat, TDS test pen, pen pH meter .